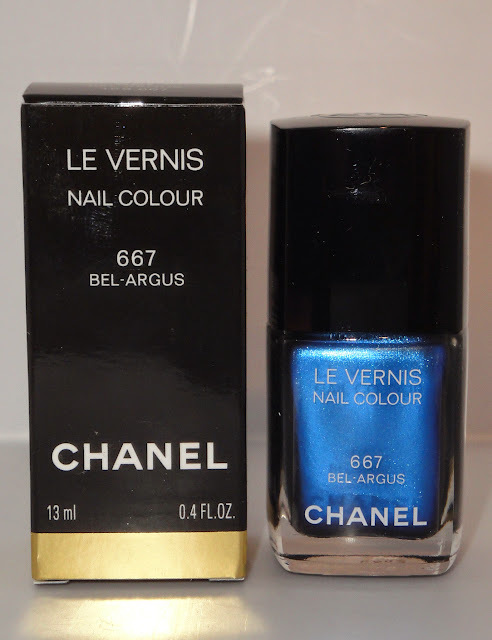 With the launch of Chanel's Summer collection I was most intrigued by this polish: 667 BEL-ARGUS. In my opinion, the shimmering metallic blue color is such a stunner. Not only does the polish look beautiful in the bottle but also, it is just as gorgeous, or even more so, on the nails. It is currently priced at $27.00 USD for .4 fl. oz. and is available at all major department stores, Chanel Boutiques, and online at Chanel.com. With the exception of the picture above, I took all my photos with little to no flash or lighting. I wanted a true representation of what the polish actually looks like on my nails without having to worry about the color appearing washed out due to my camera's flash. Nails bask in the brilliance of sun-lit coral, metallic blue and blue green.